This is the second year in what is expected to be an ongoing investigation of the feral Monk Parakeet population in Brooklyn, New York. Students went for a "field trip" to the athletic field to see and hear the Monk Parakeets. Students worked in cooperative groups to develop initial testable questions about the Monk Parakeets. Students met in the computer lab to access information about Monk Parakeets from the internet. Students studied some ongoing investigations about other Monk Parakeet populations throughout the U.S.
Students used various search engines to gain additional information about Monk Parakeets. Students refined their initial testable questions based on information gathered via the internet. Students designed their experiments and arranged to begin their investigations in the field. Students conferred with their cooperating groups to refine their methods after initial investigations. Students met in the computer lab to learn how to present the results of their investigation via the internet using WYSIWYG (What you see is what you get) html composers such as Microsoft FrontPage, Microsoft Word and Netscape Communicator. Students learned to compose text, insert pictures and make links to other internet websites. How many Monk Parakeets are there on the Brooklyn College Campus? How many Monk Parakeets are there in each nest? What are typical Monk Parakeet behaviors? Where else do Monk Parakeets nest around Brooklyn College? Are there Monk Parakeets in or around Greenwood Cemetery? 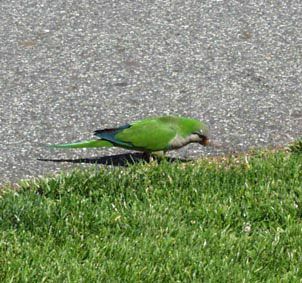 Are there Monk Parakeets in the athletic fields in or around Marine Park? What do the Monk Parakeets on campus eat? Are the nest openings oriented towards the east? Will the number of monk feathers and down collected on days after a feeding differ from days after a non-feeding? Do Monk Parakeets build their nests with a preferred species of local tree? Do Monk Parakeets always fly in groups of two or more? Do Monk Parakeets gather near the heating plant in colder weather? New York City area residents are invited to send information on nest sites and behavior observations to Eleanor Miele at the email address below.